If there's one 80's franchise that could always do with a dust off and a bit of a polish it's Skeletor and his friends. 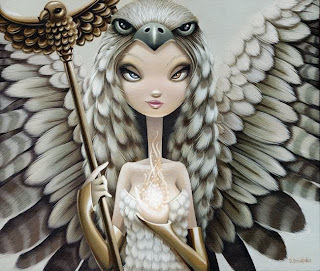 Recently L.A's Gallery 1988 have done just that, by gathering together 100 contemporary artists to each produce work re-imagining the cast and concepts of Eternia, in their own distinctive style. 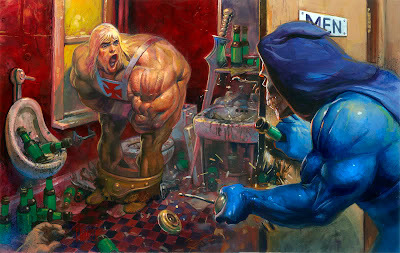 Now the light-hearted to the slightly dark are showcased in the gallery's latest exhibition, Under The Influence: He-Man and The Masters Of The Universe. Kicking off last Friday, through untill the 29th of January, the showcase covers a wide range of artistic mediums and characters. 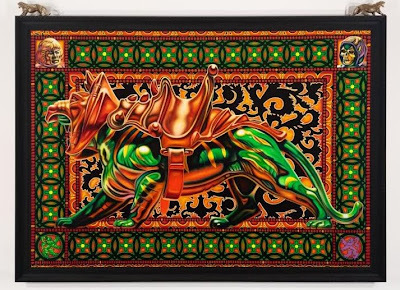 With pieces dedicated to everyone from Orko to Evil-Lyn, the winner so far has been Robert Burden's Battle Cat Statant (shown below) done in oil on canvas, which roared out the door at a whopping (US)$10,400! Many of the works are still up for sale, (including prints of Robert's Battle Cat hit - at a much more affordable price tag) and can be ordered through their website. To have a decent nostalgia-triggering look at more of the amazing highlights, such as 'Cosmo Skeletor' and 'Fall of Stratus', check out the ihavethepowerart blog. Someone paid ten grand for a painting of Battlecat? I am in the wrong business. You and me both Rob!